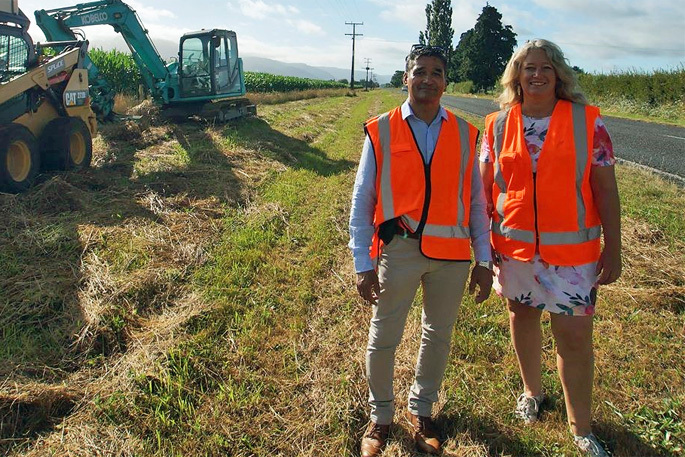 Matamata-Piako District Council group manager business support Manaia Te Wiata and Hauraki Rail Trust general manager Diane Drummond at the Rail Trail works site along Manawaru Rd. The sight of bodies on bikes along the Te Aroha to Matamata Hauraki Rail Trail is one step closer to reality now track construction is underway. Work began on this leg of the trail on January 8, following a blessing by kaumatua Mokoro Gillett, with Splice Construction awarded the construction tender. The 38.5KM grade one track will start from the Te Aroha Railway Station and head along Te Aroha-Gordon Rd, Mace and Alexandra roads, Manawaru and Tower roads to the Matamata Trail head by Railside by the Green on Hetana St.
Hauraki Rail Trust general manager Diane Drummond is excited to see the track construction underway. “Enquiries on when the new route will be rideable have been high, with visitors lining up to be among the first to experience the new trail. Diane says the creation of the Hauraki Rail Trail has been a huge boost for businesses in the Hauraki and Waikato regions and the Hauraki Rail Trail Trust has engaged with social media guru Cass Esposito, to increase traffic to the Hauraki Rail Trail website. But there is still a lot of work to be done before people will be able to experience the trail. Hedge removal and fence construction will continue during the next few months and six bridges will be installed in various locations.